The second arm of Golden Chariot, Southern Splendour Train takes you through the historical and natural hinterlands that this Indian peninsular leg is known for. Rated one of the most desirable train journeys by Vanity Fair, this train is an extension towards the south India's heritage. On this magical trail, you get a great opportunity to visit the bygone kingdoms, colourfully majestic temples, natural beaches and backwater. Slowly and steadily, you will be directed towards zenith of exploring your own self during this glorious journey. Though you will be keen to sum up your journey in the gods own country, but the six days taken to reach there are equally colourful and fulfilling. The heritage journey begins at Bangalore and takes you through the treasured kingdoms and distinct architectural marvels that have shaped up the heritage of South India. 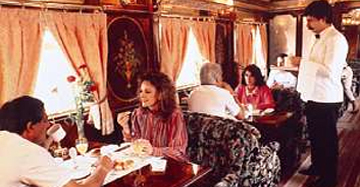 Everyday of the Southern Splendour Train is wholly rich and enticing. Through Mahabalipuram, you get to see open bas air reliefs alongside the Bay of Bengal erected by Pallavas. Moving further will bring you to a little French beach promenade of Pondicherry. Towards the middle of the journey, three elaborate cities of Trichy, Thanjavur and Madurai guard the skylines with their specimen Gopurams. At Kanyakumari and Kovalam, you get to see the beachy side of South, where you can relax and admire the picture perfect beauty of the region. 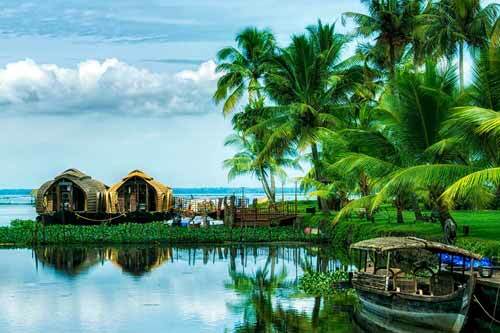 The tour wraps itself in its enriching way at Kerala where the lazy backwaters wait to wrap you in its breezy cruise. The Golden Chariot Train slowly takes you through a magical trance that can only be sensed and experienced amidst the royal indulgence of this luxury train. 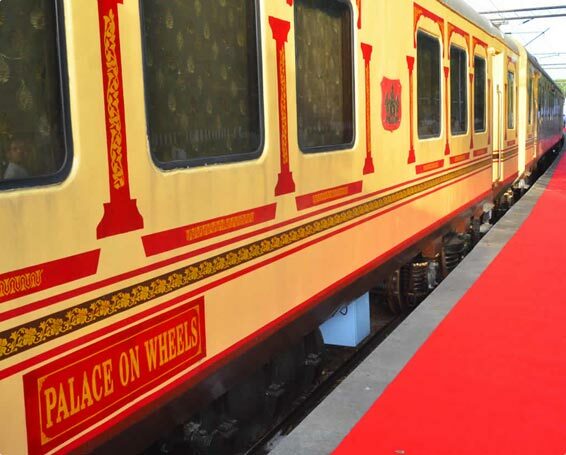 Around 15:00, you would be transferred to the Taj West End for High Tea at Banquet Hall followed by a presentation on Southern Splendour – The Golden Chariot Train. This briefing ensures the proper knowledge about the train, do’s and don’ts, safety and security onboard, etc. At 17:30, you would be taken to the Chitrakala Parishad / Art gallery where the colourful canvas of imagination can be explored. This will be followed by a Cultural Show from 18:30 to 19:30. Post this cultural show; you will be transported to the Platform no 6 of Yeshwantpur Railway Station at 20:00 where heartwarming Indian welcome in traditional way would exhilarate your senses. 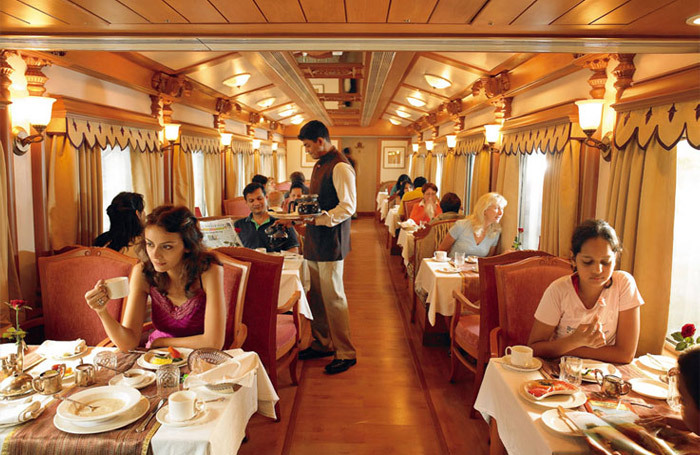 Dinner onboard The Southern Splendour – The Golden Chariot. Around 21:00, you would be departed to Chennai. Option 2 at Bangalore would be allowing you to explore Our Native Village, a 100% eco resort of The Golden Chariot. In the morning 11:00 onwards, you would check in at Our Native Village, followed by the lunch from 12:00 to14:00. 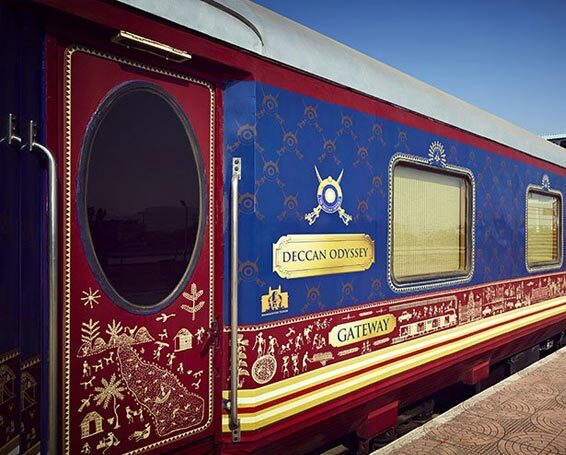 Post lunch, you would be briefed about the Southern Splendour – The Golden Chariot Train for 30 minutes. 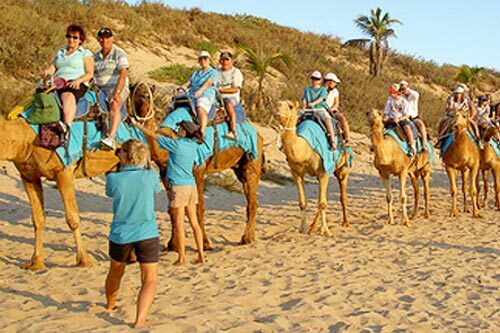 At 15:00 to 15:30, you would be touring around the 100% eco resort. 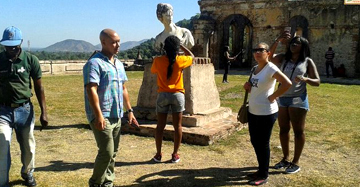 The experience would be enriched at 15:30 with the art and culture tour of Revivalist movement. At 16:00, you would be given a half hour guiding tour on living an organic life with the Herbal and Medicinal Plant Tour. From 16:30, you would be directed towards a 1 hour excursion in the village where pottery session, Indian village games & Bullock cart rides can be enjoyed. After such a fulfilling experience, you get to rest for half an hour. At 18: 30, you would be departing to board your Golden Chariot at Platform no. 6 at Yeshwantpur Railway Station. *Optional itinerary for those who do not opt for Taj West End Check-in and Bangalore sightseeing. Early morning at 05:30 you would be arriving in Chennai, the traditional capital of Tamil Nadu. The breakfast would be served onboard at 08:00 in your Southern Splendour Train. Around 09:30, you get to enjoy the drive through the Marina Beach by road coaches. The day’s exciting excursion would take you through Mahabalipuram at 10:30. The Group of Monuments at Mahabalipuram is a World Heritage Site known for its ancient temples, open air bas reliefs and stone carvings brought to life by the Pallavas. Reach Mahabalipuram or Mamallapuram at 11:30 and explore Five Ratha’s Temple, Shore Shiva Temple and the carved caves. Around 14:00, you would be served lunch at Lunch at GRT Temple Bay (Radisson). 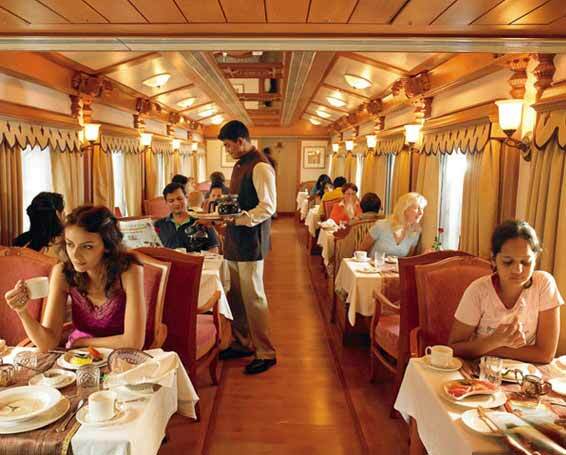 At 17:30, you would be boarding Southern Splendour – The Golden Chariot at Pondicherry / Puducherry. In a short 1 hour journey onboard, you would be reaching pristine Pondicherry, which is known more as a little France promenade in India. This small Union Territory is famous for Sri Aurobindo Ashram, one of the well known ashrams in India and Auroville, the abode of Saint Aurobindo. You would be surprised to see that everyone in the hinterlands of Pondicherry are well-versed in French. Around 18:30, you would get to stroll around the rocky beach at Pondicherry. At 20:00, you would board the Golden Chariot back for dinner and overnight stay in your plush kingdoms. Highlights of Day 2 - Visit World Heritage Site of Mahabalipuram and little French colony of Pondicherry. 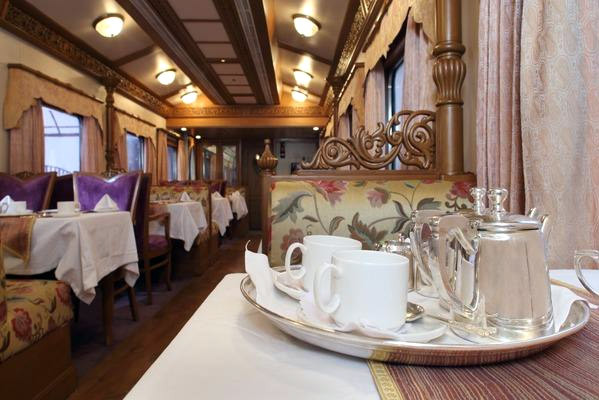 Begin your day 3 onboard the Golden Chariot Train with the breakfast at 8:00. Post breakfast, you would be taken for a tour through Auroville Ashram and Matrimandir at 9:30. 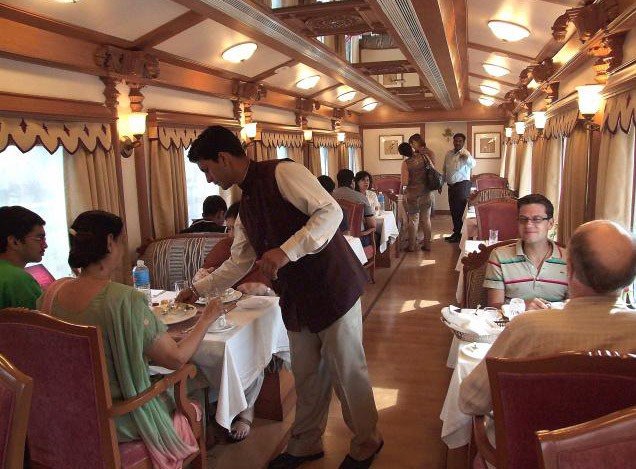 Post this enriching excursion, return back to the luxury train, where piping hot lunch would be served to you. At 16:15, again you would be getting a chance to visit the Aurobindo Ashram. Further experience at Pondicherry includes a pleasant evening stroll on the beach and a visit to French town for shopping. Around 19:30, enjoy local French dinner at a local restaurant. * Around 22:00, board TGC for overnight journey to Trichy. The train will depart for Tiruchirapalli / Trichy at 23.30. Highlights of Day 3 - Explore Pondicherry in detail with Auroville Ashram and Matrimandir. You would be arriving at Trichy in the morning at 6:00. Around 8:00, you would be served with the breakfast on board. At 9:00, you would visit the Ghats in Trichy and drive towards Tanjore by coaches. Tanjore is the 'Rice bowl of Tamil Nadu' and is proud legacy holder of oldest cities in India. The cultural capital of India, this city is famous for Brihadiswara Temple, a historical monument belonging to the medieval 11th century. A visit to this a UNESCO world heritage site at 11:00 will be a fulfilling experience. Two hours later, visit Sangam Hotel for Lunch in Tanjore. Post lunch at 15:00, you would be visiting Tanjore artifacts (Metal) and Paintings workshop. In evening at 17:00, come back to your kingdoms on The Golden Chariot to relax and enjoy facilities onboard. Enjoy the dinner at 20:00 and later depart to Madurai post midnight at 00:15. Reach Madurai in the early morning at 5:15 and enjoy your breakfast at 8:00. Around 9:30, visit the famed Meenakshi temple and indulge in local shopping at this sacred city of sweet nectar, Madurai. This continuing old heritage city is laid around the Meenakshi Temple and is famous for its colourful Gopurams. 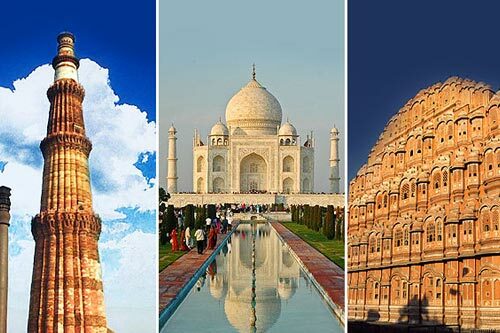 This temple is India's one of the greatest cultural landmarks. 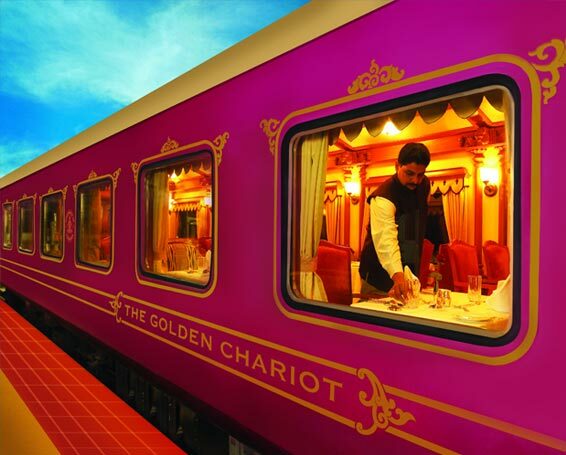 Post the visit to the temple, enjoy lunch at The Golden Chariot Train at 13:00. In evening, visit The Thirumalai Nayakar Mahal and enjoy the Light and Sound Show in this Indo-Saracenic marvel. At 20:00, you would be enjoying the dinner with live Classical Music at the Heritage, Madurai. Board your train back at 22:00. Further at 23:15, depart to Nagercoil for an early morning visit to Kanyakumari, the point where three seas meet. Highlights of Day 5 - Capture the moods of mesmerizing Madurai with Meenakshi Temple and Thirumalai Nayakar Mahal. Light and Sound Show will introduce you in depth with the architecture of the royal palace. Highlights of Day 6 - Find more about the alluring beaches of Kanyakumari and Kovalam. Visit to the Travancore seat, Padmanabhaswami Palace is another attraction of the day. Begin your day 7 with the departure to Alleppey at 5:00 and enjoy hearty breakfast onboard. You would be arriving Alleppey / Allapuzha at 8:30. The surreal experience would be beginning with a houseboat cruise in Alleppey, where wine/beer, coffee/snacks could be enjoyed. At around 13:00, lunch in Kerala cuisine would be served on the houseboat. Post Lunch, arrive Kochi by road trip at 15:00. After arrival, you would be experiencing the attractions of Kochi with a visit to the Church, Chinese Fishing nets and walk around Jew Town. Post this hearty excursion, board back The Golden Chariot Train and depart for Bangalore at 19:30. 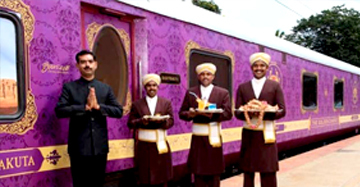 Have your farewell dinner served onboard The Southern Splendour – The Golden Chariot Train. Highlights of Day 7 - Embark on an enchanting houseboat cruise Alleppey. And find out more about Kochi, the gateway to Kerala. 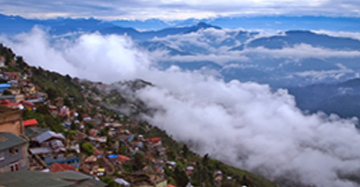 Reach Bangalore with the unforgettable memories of Southern Splendour. Breakfast on board would be served. Arrive Yeshwanthpura Railway Station at 10:00 and bid adieu to The Golden Chariot. Begin your most waited experience of backwaters in Alleppey on the last day. 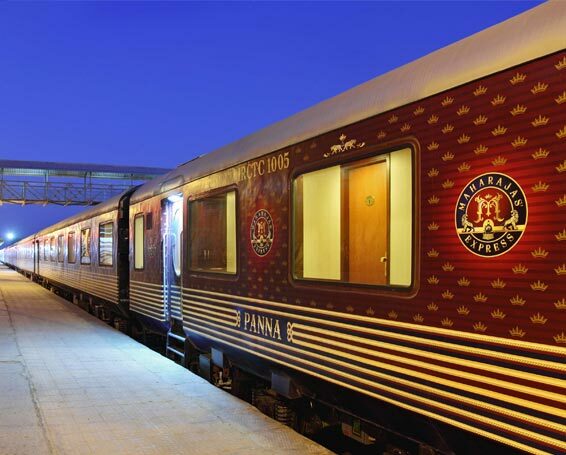 Accommodation – The Pride of South of Golden Chariot Train is equipped with 11 fully air-conditioned chambers bedecked with 26 twin beds, 17 double bed cabins and 1 cabin for physically challenged. The chambers are furnished with history. The ambience including interiors, furnishings and furniture is recreated on the lines of Mysore and Hoysala indulgence. Take a plunge into a royal bed, admire the intricate carvings on the ceiling and relive the royal living, once in a lifetime. The coaches of The Pride of South derive their name from the dynasties who reigned the glorious kingdoms of Karnataka. 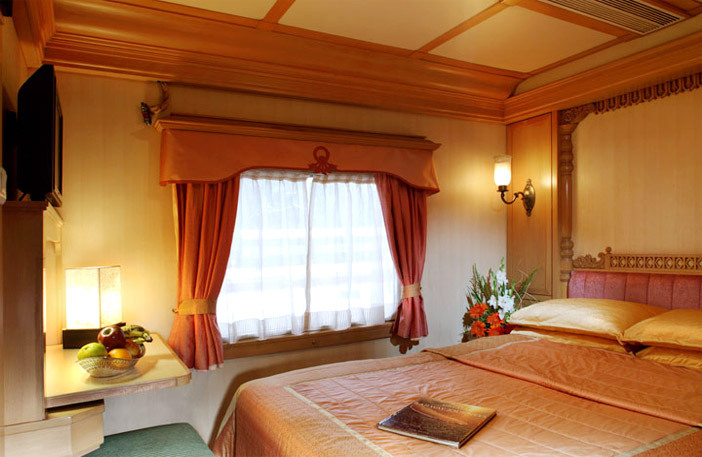 The royal accommodation is also outfitted with vanity / writing desk, LCD TV, DVD with 6 satellite channels, wardrobe and a private bathroom cubicle with luxurious accessories. Bar – The Madira Bar of Pride of South Train is inspired by the divine elixir of gods that offers pleasures of enjoying the handpicked variety of branded wines, liquors, spirits par global standards. The seating arrangement at the bar is created keeping in mind the lavish ambience of Mysore Palace. 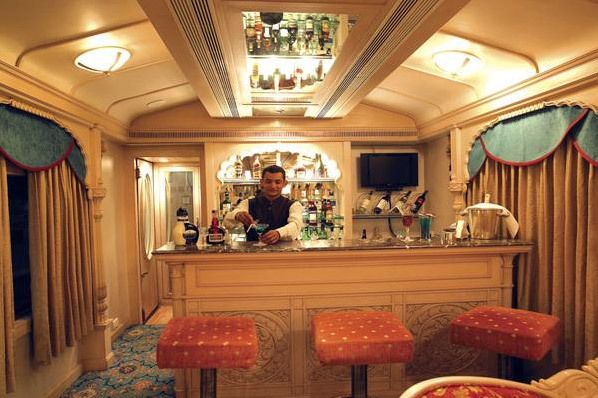 The bar lounge is a favourite place for socializing over drinks and chatting up with the co-passengers. Restaurants – Two restaurants namely “Nalapaka” and “Ruchi” take you to a culinary tour of refined taste serving rich vegetarian and non-vegetarian delights. These sumptuous restaurant’s interiors are inspired by the timeless aesthetics of Hampi and Halebid. Attendant – A royal attendant is always available at your service, to take care of all your needs onboard. For disabled persons – Special attention is ensured on the Pride of South train for such passengers. 1 special cabin is assigned for such special guests. Arrival kit – A Welcome Kit will be provided to you onboard the Pride of South Train. This kit features everything related to your Pride of South Train. Arogya Spa – The Arogya Spa of The Pride of South Train is an Ayurveda center equipped with all the necessary rejuvenating oils and a masseur. Gymnasium - The Gymnasium of this luxury train is bedecked with the latest equipments like the treadmill, cycle and stepper for exercising the royal flexes. The gym has a changing room, steam bath, two shower rooms and a toilet. Drinking Water – Purified water will be provided throughout the journey. Shopping – Selected handicrafts and other special items can be purchased during shopping sessions of the Pride of South Train Tour. Smoking – Though Pride of South is a no smoking train, still you can smoke at the places with the guidance of our captain. Internet – Internet facility available onboard with Laptop. Events onboard – Special events like business conferencing can be organized on the Pride of South Conference Coach where 30 business leaders or professionals can indulge in the productive conference. The conference is also equipped with 42 inch LCD TV and high speed internet surfing. Medical Aid – Medical aid is available as a facility on this luxury train. First aid is available on the train whereas a doctor can be arranged on call. At the every station. Doctor is available for 1 hr. 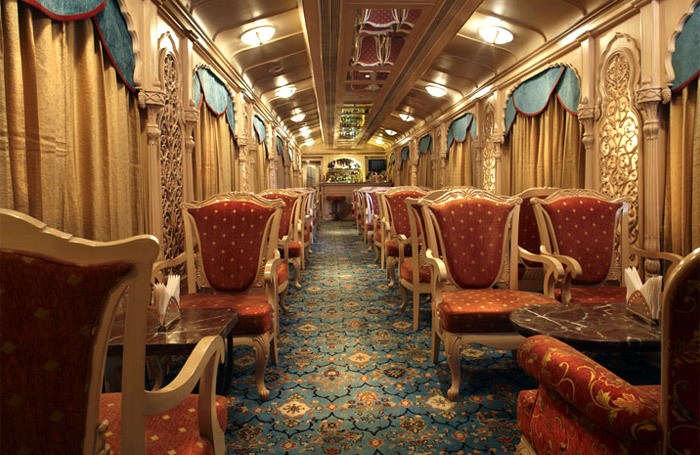 Everything about Southern Splendour Train is grandly magnificent. Suffused with out of the world luxuries and convenience onboard, this train explores the other side of South India that is surrounded by the seas. This part of south is intertwined with the culture, architecture and enriched legacies that can be explored during a tour only. Southern Splendour is an attempt to delve deep inside the cultural heritage of India. Bedecked with optional beginning tours, this train is best known to explore best kept secrets of south India. The train can be best availed during the season time October – March. Block your dates from the schedule below and avail the best of Southern Splendour experience in this luxury train of India. 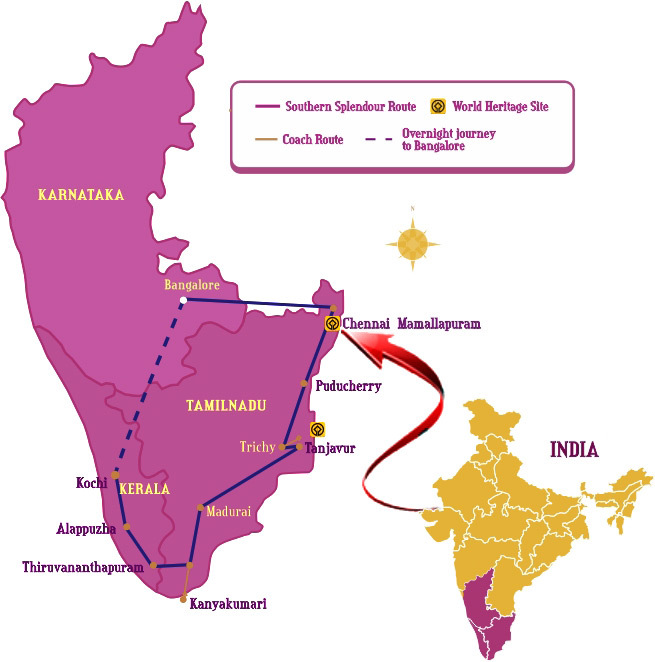 The Golden Chariot Train has also started running on a different South India tour circuit ,covering Mamallipuram, Pondicherry & Kerala Backwaters .This tour circuit is also known as "Southern Splendour"
50% of tariff for children between 5 years and 12 years of age. Taxes will be extra as applicable. There will be a 10% surcharge levied on the tariff for the trips falling during Christmas and New Year. No Charter can be booked during X-mas & New Year period. Tariff does not include Drinks, tips, laundry, telephone calls, video camera fees, SPA Car, Business Car Facilities and other items of personal nature. Remaining 80% of ticket value 60 days prior to departure of the tour. 50% of ticket value at the time of confirming the booking. Remaining 50% of ticket value 60 days prior to departure of the tour. 5% of ticket value 60 days prior to departure. 20% of ticket value between 30 to 59 days prior to departure. 100% of ticket value less than 30 days prior to departure. 10% of ticket value 60 days prior to departure. 100% of ticket value between 0 to 59 days prior to departure. Amendment - Is only possible under the circumstances like Natural Disaster / Natural Calamity or Serious Health Problem's (this needs to be supported by doctor's certificate) and is subject to availability. No refunds are possible and every case be decided on merits on a case to case basis. The Southern Splendour Train begins its scintillating voyage from Bangalore and enters the other metropolitan city of Chennai. From Chennai, the journey enters 7th-9th century era with Mahabalipuram Group of Monuments. This temple, erected by the Pallavas is another unique specimen showcasing brilliance on stone structures. From there, the tour surges ahead towards French colony of Pondicherry in great detail. The next halt of this Golden Chariot takes you around the golden era of south, visible through its temple cities of Tiruchirapalli, Thanjavur and Madurai. Herewith begins another exploration that South India is known for. Beaches. The second beach after Pondicherry belongs to Kanyakumari, the meeting point of three seas where watching sunrise in early morning hues is a surreal experience. Kovalam is the next beach that follows the train with its balmy surroundings, making it a pristine ecosystem. The prime attraction of Southern Splendour Train, Backwaters form the zenith of the tour, where houseboat ride in Alleppey does wonders for your soul.